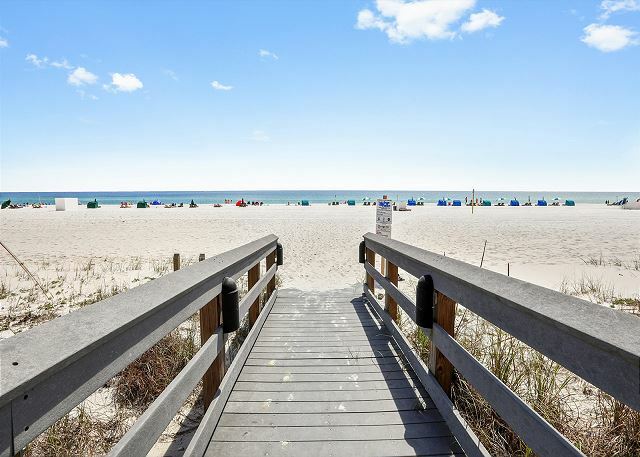 Panoramic views of the Gulf from the master bedroom, the living area and large balcony as well as its beachy décor make this 1,341 square foot, two bedroom, two-bath ninth floor condominium a renter's favorite. Fully appointed kitchen includes ice maker, microwave, dishwasher and laundry area with full size washer and dryer. Other features include comfortably carpeted bedrooms and tiled floors in the living and dining room, ceiling fans, central heating and air conditioning, and a large master bath with whirlpool tub, separate glass enclosed shower, double vanity and lots of closet space. 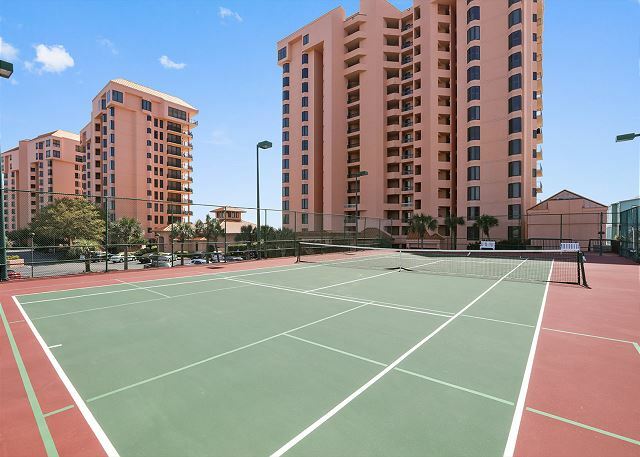 Nice condo in a great complex in a great location. The furniture was nice and comfortable, in fact, the bed is the most comfortable we've ever had in a rental. We were told the unit had an icemaker and were very disappointed when we arrived and found out the only icemaker the unit had was in the small freezer compartment of a very small kitchen refrigerator. Also, the kitchen was not very well stocked with utensils or cookware. Very comfortable, clean, relaxing and quiet. Enjoyed it very much. View from the unit was excellent!! Thank you for your feedback. We're so glad you enjoyed your stay with us and hope to see you again soon! The condo was pretty and comfortable with a nice kitchenette- all appliances etc were handy and functioning well. The bedrooms and bathrooms were clean and well furnished also. Unit was in good location. Great view and clean. We would rent this unit again. We enjoy the location. The new highway barriers were different in our entrance. The property is well maintained. This is our third year to vacation st Sea Chase. The kids love all the pools. We love that this area of the beach is not crowded. This unit was clean but only had 1 roll of tissue in each bath. One trash bag in the kitchen. Most other units were better stocked. We prefer a unit with an ice maker. The extra ice trays were appreciated. We cook a lot since we have small grands that don't enjoy eating out. We would suggest the addition of a large skillet. Thanks for our flexible date scheduling. We enjoyed our time on the beach so much. Wonderful unit and condo location. Clean and comfortable. We enjoyed the week thoroughly. The kitchen pots/pans and knives are way past their prime. Towels of lower quality with not one beach towel. Pool rules are VERY lax. Children used large pool toys and young children took over the hot tubs all hours. We didn't want in the hot tub just concerned that it wasn't healthy for them. Would be wonderful if one pool could be adults only! Since finding SeaChase I refuse to stay anywhere else! Love the staff, the grounds are gorgeous, units are extremely spacious, and the location is just right!! Can't wait to book another vacation! Really enjoyed our stay. Especially enjoyed the day trips.